When did Pesach become like the riddle of the Sphynx? Yes, I see the irony… Seriously though, it’s all fun and games when you’re a kid. Chocolate lollipops and spreading cream cheese on shmura matzah without breaking it. Then it’s frantically figuring out what to feed your finicky toddlers without Cheerios and pasta. Next, it’s menus, guests, cooking marathons and NO TAKE OUT! Then it’s back to fun, comfort, grandchildren (iy”H) and enjoying those arba kosot. So, can you guess my stage? I’m not sure how or why, but I found myself frantically planning menus around Chanukah. Luckily, I calmed down somewhere around Purim Katan (gotta love that extra month). I remembered my Substitution Guide motto. Keep. It. Simple. 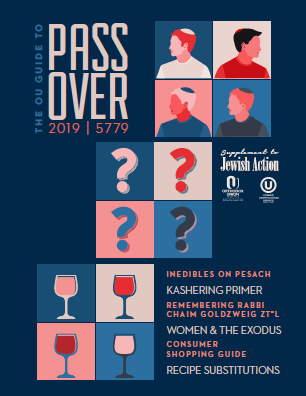 Each year on Pesach, I prepare recipes that have proven to be successful all year round and are permissible (albeit with some tweaks) on Pesach. The right recipe and the right ingredient substitutions can make all the difference between a satisfied family and your crying over the remains at the trash can. But before you begin swapping out ingredients on your favorite layer cake, read through the recipe you want to adapt very carefully. Consider the quantity of the ingredient you’d have to replace and look it up here to see if you can do it with ease. Remember, this stretch of the Sphynx riddle lasts the longest, so find a way to make it work for you. Stick with recipes you know, and you’ll be assured a tasty and stress-free eight days!